I have had a life long connection with Eddie Palmieri. As a kid growing up in the 1970s, I heard my father play “Kinkamache,” “Pa’ Huele” and “Bilongo” in our living room over and over. My brother Ray took piano lessons with Eddie’s older sibling Charlie. And when I started DJ’ing and collecting records, I found myself in awe with Palmieri’s Harlem River Drive and Live At Sing Sing albums. In my estimation, “Azucar Part II & III” is pure brilliance, and the epitome of how intense the energy can be when Latin music meets raw Funk breaks. Awesome! I had the honor of opening up for Eddie Palmieri’s 75th Anniversary concert in December 2011. 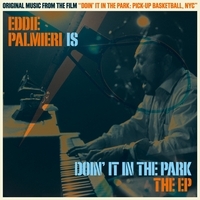 Kevin Couliau and I had some DOIN’ IT IN THE PARK scenes that needed music, so I ran the idea by Palmieri’s camp. I had no idea that the nine-time Grammy Award winner had never been asked to score a film (shame on Hollywood, but good fortune for us)! Eddie viewed our rough cut and accepted the task with excitement. My vision, and hope, was for Eddie Palmieri to create original compositions inspired by scenes in our film that would lean towards the essence of what Harlem River Drive represented. When I walked into the recording session and saw Ronnie Cuber, (the saxophonist who appeared on that genre breaking HRD lp), bassist Luques Curtis, and drummer Obed Calvaire, I instantly knew Eddie had something special planned for us! Those dudes are bad, as in nasty. The kicker was when vibraphonist Joe Locke sat in for “Locked In,” a tune Eddie titled in Joe’s honor. My father also played vibes. There is something about hearing mallets ring on metal keys that echo warmth in my spirit. My pops is no longer with us but I felt his presence during this session. Palmieri and Locke could have been reminiscent of Palmieri’s collaboration in the ‘60s with Latin Jazz vibraphone legend Cal Tjader (on the Nuevo Sonido album). Joe however poured his heart out and played so aggressively, perhaps inspired by the combo of Latin, Jazz, and Funk musicians in the room, that he put his own stamp on the instrument in a solo performance that I believe is worthy of Grammy consideration. Eddie Palmieri created timeless compositions for me and Kevin’s project during that unforgettable, for me at least, recording session that day. I still can’t believe I sat in on all of it, and even more so had input on the vision and direction. We used the bluesy “Coast to Coast” (which Eddie titled because of the basketball term) and the ethereal “Jibarita y Su Son” in our film’s score. This soundtrack ep also features the funky “Locked In” tune as well as drum solo outtakes from the session (which hip hop producers are bound to eat up and sample). In an attempt to emulate the classic Wild Style film soundtrack from the ‘80s, I added some sound bites from DOIN’ IT IN THE PARK in between the tracks as interludes. To create the perfect mix down, I recruited legendary engineer “Breakbeat” Lou Flores. Flores was part of the duo who compiled the Ultimate Breaks & Beats series, which was a foundation and blueprint for any DJ or producer worth their weight in the ‘80s and ‘90s! We all had every volume in our record crate! This EP was orchestrated to bring you to the world of NYC, from our mythic outdoor basketball courts to the afro-world rhythms that permeate the asphalt. It was a joy to create. Listen to the fullest and let it take your mind someplace special . . .